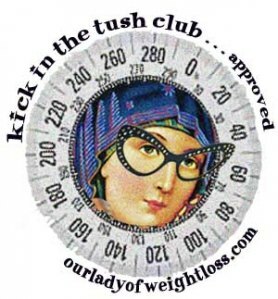 Our Lady of Weight Loss, the patron saint of permanent fat removal (she who guides me) is serious about weight loss, but not heavy! She asked me to share the following 9 tips with you that she feels will surely up your energy, keep you focused, and help you to create a balanced and harmonious life. 1. Balance & Harmony: Permanent weight loss is about living a balanced, harmonious life. It’s about looking at all areas of your life — physical health, mental health, relationships, finances, career, fun, creativity, spirituality, physical environment, time — and creating them so that they support you to have the best life ever. Focusing only on weight loss will not serve you well. You may lose it; but without creating balance and harmony in all areas of your life, you will in all likelihood find it again. We’re talking permanent weight loss here! 2. Commitment: Make a commitment to you, all of you, every aspect of you. Losing weight won’t fix what’s wrong with your finances. Gathering buckets of money won’t help you to lose weight. Commit to giving yourself the best life that you can. Do this for you and your body! 3. The Scale: Do not get hung up on the number on the scale. Do you know what the scale really measures — scientifically that is? Every object in the universe with mass attracts every other object with mass. (Some more massive than others!) Therefore, there is a pull — a force — an attraction between you and the Earth. Your bathroom scale measures gravitational pull! Nowhere in scientific date — that I could find — does it state that the scale measures hideous fat. Nor does it say that you are bad! 5. Safe Haven: Keeping your home clear of the Devil’s Food, red light items, things that send you off on a binge is essential! Making your home a safe haven affords you an opportunity to establish healthy, solid habits. It is essential that you create an environment that supports your permanent fat removal efforts; a place where you are as free as possible from excessive food thoughts. 6. De-Clutter. I’ve been both organized and disorganized, I can tell you the first way is the better way. Not only do you not waste time endlessly searching for stuff, but there’s a mysterious calm one finds in organization. 7. Be Imperfect. There is no need to be perfect. It would be unbelievably boring if we were perfect. So dry, unpleasant, Stepford Wife-like that we would seek imperfection. Revel in your imperfection. 8. Be Your Passion. Jump head first into the thing you love to do the most. Life will improve in ways you never imagined. You will be focused on what you love, feel less-stressed, be more productive, procrastinate less. The energy will shift dramatically. Can you feel it now? 9. Wake Up. You are 25 times more open to suggestion as you wake. Pay attention to what thoughts first surface, and if these first thoughts are not helpful, simply turn them around. Repeat your positive thought(s) a few times. Hold on to those good feelings for a moment or two. And then, ‘see’ the thought and imagine carrying this thought with you throughout the day. Spread the SUNSHINE … NOT the icing! Copyright © Beliefnet, Inc. and/or its licensors. Posted on July 12, 2012, in Healthy Fab and tagged Balanced Life, diet tips, fitness, Happiness TIPS, health, healthy-living, inspiration, Janice Taylor, Kick in the Tush Club, motivation, Our Lady of Weight Loss, Spiritual Weight Loss, weight loss, Weight Loss Success Coach, Weight Loss Tips. Bookmark the permalink. Leave a comment.